Engaging hospitalized patients in their medical care is a National Patient Safety Goal, but methods to achieve this goal remain challenging. Efforts to create “goals for the day” are traditionally provider driven and fail to engage patients in their own goals. The published literature on patient‐driven daily goals is limited, including what patients identify as their daily goals and how providers and systems may learn from this information to deliver patient‐centered care. As part of the TOPS (Triad for Optimal Patient Safety) project, we surveyed medical inpatients about their daily goals al a university medical center, a nonteaching community hospital, and an integrated health system hospital. Nurses used a specially designed “Tell Us” tent card that asked patients each morning about a “goal that will improve your care.” We developed a taxonomy for the collected patient goals through an iterative method that started by having 3 authors independently read a 10% sample of the goals and propose defined categories. After a preliminary code book was developed, a second independent review took place on a different 10% sample with modifications made to the codebook. Finally, 2 authors independently used the final codeboak to categorize a distinct 20% sample. Cohen's kappa for agreement between the 2 coders was 0.90, indicating near‐perfect agreement, The rest of the goals were then categorized accordingly. Of 472 patients surveyed, 471 patients provided at least 1 written daily goal. A total of 675 daily goals were collected and categorized into our taxonomy that consisted of 14 distinct categories (see Table 1). The categories ranged from obtaining medical information and clarifying plans of care to diet, sleep, and mobility. The most frequently cited patient‐driven goals were those related to discharge planning (21%). The next most cited goals were related to pain control (13%), followed by mobility (10%), direct communication with provider (8%), diet(8%), clarify in patient plan of care (7%), and to get better (7%). Patient‐driven goals focus most frequently on those related to discharge planning, pain control, and mobility. These categories should be priorities for systems designed to elicit and address such goals and to deliver patient‐centered care. Our proposed taxonomy also provides a framework to further evaluate patient‐driven goals and how these goals may improve patient satisfaction and clinical outcomes. C. Lau, none; W. Anderson, none; M. Blegan, none; S. Gearhart none; N. Sehgal, none. 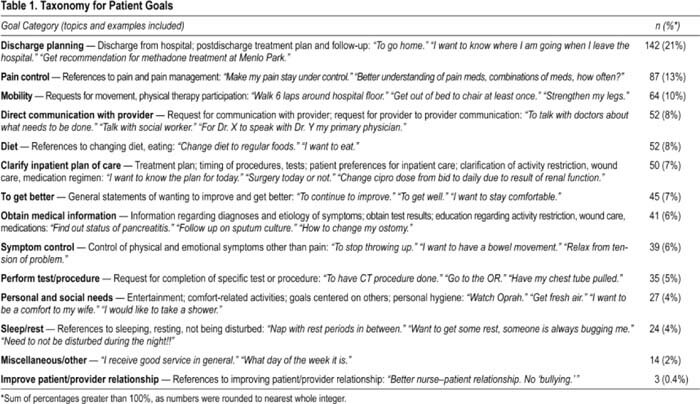 Lau C, Anderson W, Blegan M, Gearhart S, Sehgal N. A Taxonomy and Description of Patient‐Driven “Goals for the Day” during Hospitalization. Abstract published at Hospital Medicine 2010, April 8-11, Washington, D.C. Abstract 85. Journal of Hospital Medicine. 2010; 5 (suppl 1). https://www.shmabstracts.com/abstract/a-taxonomy-and-description-of-patientdriven-goals-for-the-day-during-hospitalization/. Accessed April 25, 2019.